After the C&O Ry took control of the Hocking Valley Railway, it became the Hocking Valley Division of the C&O Ry. Over the ensuing years as the coal mines played out and traffic diminished, many changes took place as outlined here. The years since 1930 have not been good to the Hocking Subdivision or the Pomeroy Subdivision and all the branches. The last scheduled passenger train on the Jackson Subdivision operated into Jackson on April 2, 1931. 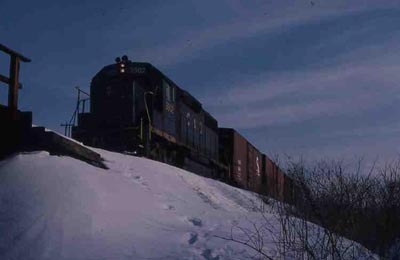 The section from Dundas to Coalton was abandoned in September 1967. The five miles of track between Coalton and Jackson are owned by the City of Jackson. The abandonment of the Straitsville Branch from the north edge of Logan to Monday Creek Junction occurred on March 31, 1934. The second track on the Hocking Subdivision from the east end of Parsons to Oldtown Junction near Logan and from East Clayton to Beaumont, 34.66 miles except passing sidings, was retired on August 31, 1935. Various branches and mine spurs were abandoned between 1937 and 1971 with the Monday Creek Branch being the last to go. Almost 12 miles of the Hocking Subdivision from Nelsonville to Armitage were retired August 30, 1972. The 4+ miles between Nelsonville and Diamond were abandoned December 15, 1978, and the portion between Diamond and the east end of Logan soon afterward. On September 1, 1987, C&O successor CSX sold 43.5 miles of what was in more recent years known as the Athens Subdivision from Milepost 9 to Milepost 52.5 to the Indiana and Ohio Central. Rail America owns the I&OC. The portion from Milepost 52.5 to Milepost 63.5 is operated by the Hocking Valley Scenic. The remainder is abandoned. The last regular train on the Pomeroy Subdivision from Pomeroy back to Logan occurred June 7, 1979. The track remained mostly unused, except Conrail movements between Kanauga and Hobson, until the C&O received permission to abandon the line from Oldtown Junction to Minerton and the former Pomeroy Belt on December 31, 1982. A mine run from Minerton to Cheshire operated until November 1989. The only active or existing track is from Kanauga to Hobson used by Conrail successor Norfolk Southern. In Toledo, Presque Isle Dock opened in 1930 with two coal machines. A third came in 1935, and a fourth in 1959. Machines one and two were destroyed July 9, 1990, as obsolete. On the Toledo (later Columbus) Subdivision north of Columbus, everything remained double track with center passing sidings through the last run of The Sportsman on April 30, 1971. Beginning March 3, 1972, and ending April 29, 1981, much of the double track was removed from Hyatts to Loudon (east of Fostoria) except through Marion and Carey. The C&O applied to acquire the Toledo Terminal Railroad on May 18, 1983. As of July 1, 1984, it got the east side portion from Bates to Hallett and the N&W got the west side from Gould to Fitch. Hallett to Fitch is unused and disconnected. Bates to Gould has been out of service since about 1980 due to the condition of the upper bridge over the Maumee River.